not a writer was stirring, none lifted a hand. scribes opened their Bibles, to meet Jesus there. inhaling the Scriptures, believing they’re true. each writer excited to seek the Lord’s face. 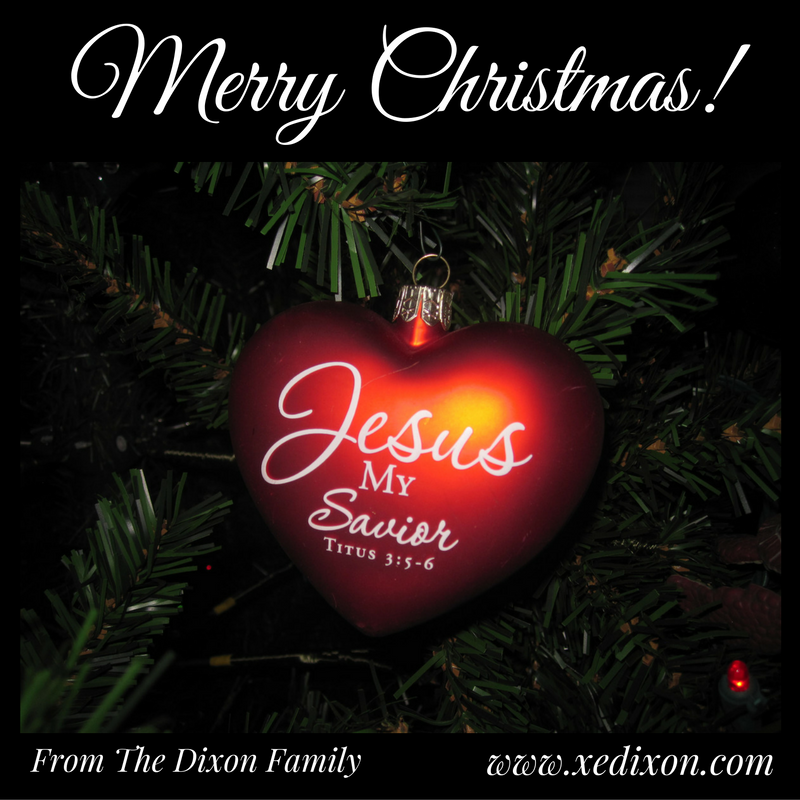 to affirm, with great hope, that Christ was their reason. Yes, God−above all−gave them purpose to write. The Lord−above all−was their Hope and their Light. They prayed for their loved ones. They prayed for their readers. They prayed for their projects, their friends, and their leaders. Hearts fully surrendered, they asked God to be clear. They asked Him for wisdom to last through next year. Each writer confessed their worldly behavior. They wanted so much to be changed by their Savior. these writers prepared for the obstacles they’d face. Discouragement. Doubt. Some would even fight fear. But, the scribes would not quit. Not today. Not next year. They had readers to serve, with each word and each story. In the power of the Spirit, they’d write for God’s glory. Be it novels or poems, their message the same. Through devotions and articles, they’d spread the Lord’s name. No frets over platform. With no worries, they’d edit. With courage they’d write and give God all the credit. Honing their craft, they’d trust the Lord’s choices. They’d share the Good News, with their God-given voices. In courage and faith, they’d gather for training. No comparing, competing, criticizing, complaining. They’d encourage each other, giving Jesus their best. But the day before Christmas, in God’s presence they’d rest. There’d be time to meet deadlines, to critique, to write brave. And they’d make time to reflect on all that God gave. Christian writers were resting secure in God’s hand. They’d surrendered their dreams to the Lord and obeyed. In His unchanging character, their hope and faith stayed. it was His words they’d ponder, each day and each night. these scribes would persist, content with God’s pace. They’d honor their Savior and bask in His love. They’d serve with great gladness, as He watched from above. With total submission, on God they’d depend. They’d trust in His plan and be willing to bend. the Spirit of God would be with each brave scribe. they’d follow the High Priest, who knows how they feel. God’s scribes, moving forward, persevering and steady. Photo taken by and Meme created by X.E. Dixon. Giving the Gift of God’s Word to Students in Chile: You Can Help! Have you been blessed by reading your Bible? Could you imagine not having access to a Bible? As I celebrate my birthday in September, I’m thankful for the ways the Lord has changed my life through the power of His unchanging and infallible God-breathed words in Scripture. I’m also thankful for the opportunities He’s giving me to share His truth and His love to the ends of the earth through the written word. I’m especially excited about the privilege of serving as a contracted writer through the ministry of Our Daily Bread. Wanting to thank God for His abundant blessings, I decided to give instead of receive gifts for my birthday this year. So, how can one writer give in a way that impacts lives for years to come? By remembering God’s Word is the greatest gift we can give someone, and God’s children work best when they work together. There are students in Chilé who need and want Bibles, but who cannot purchase them. My writing and prayer partner Colleen Shine Phillips and her husband Steve have been serving as missionaries in Chilé for over 40 years through Christian World Mission. 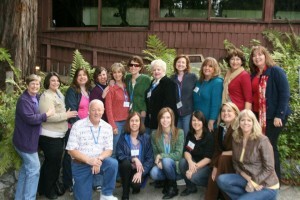 They’ve helped establish Christian schools that the Lord is using to change the lives of students and their families. This year, CWM would like help in distributing 100 Bibles each day for 100 days. We need your help in praying for these students and in raising the funds to purchase Bibles that will be personally delivered to the students God has placed on the hearts of the CWM team. Colleen will be sending me updates and photos of the kids as they receive our gifts. I’ll share them on my blog as we continue to pray for these students in South America. A box of 28 Bibles costs $70.00, shipping and handling included. CWM is praying they can distribute 360 boxes of Bibles to their students in Chilé. That’s 10,080 Spanish New International Version Bibles placed into the hands of children, giving them the opportunity to seek to know God personally. Would you consider praying with us and donating at least $2.50 to provide one Bible for a child? 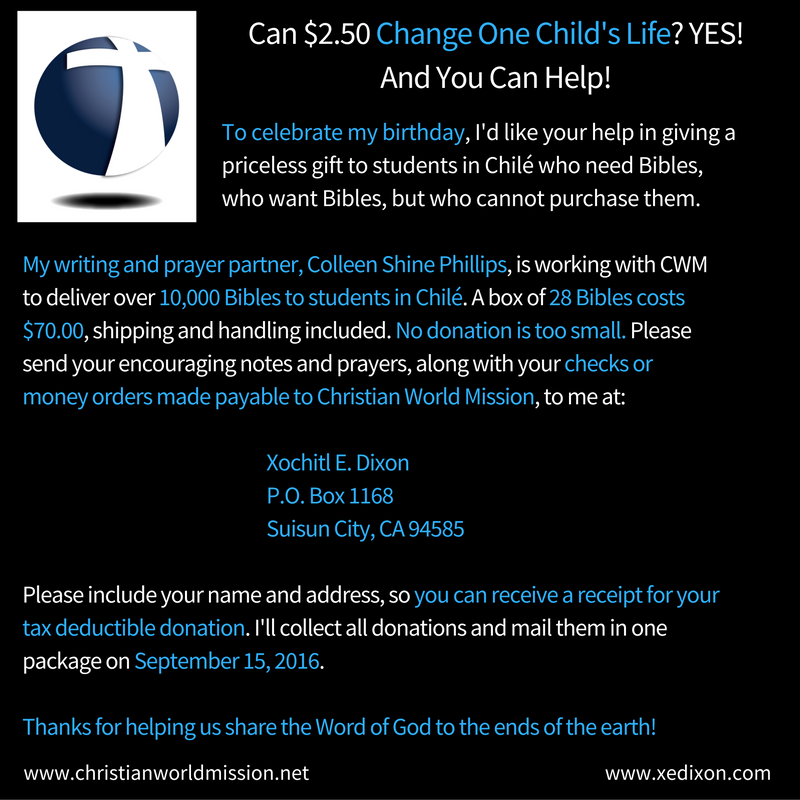 Would you give $5.00 to bless two children, or $10.00 to place God’s Word in the hands of four children in Chilé? There is no donation too small or too large. Together, we can share the gift of God’s Holy Word with children in South America. I will collect donations and mail them in one package to Colleen on September 15, 2016. Include your name and address, so that you can receive a receipt for your tax deductible donation. Thank you for your prayers and for blessing these students with Bibles they would not be able to afford without our help. Please take a moment to pray for Christian World Mission and visit their website to find out more about what God is doing in and through this ministry. When circumstances feel overwhelming, we can count on God to keep His promises. 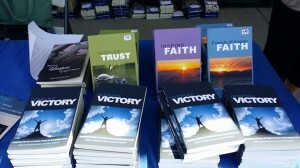 I’m thankful for the privilege of having three of my stories published in Inspire Promise. In “The Promise,” Logan struggles with the shame of his temptation and discovers he’s not the only one who needs to hope in God’s promises of forgiveness and redemption. In “A Beautiful Mess,” Melissa agrees to a dreaded visit with the pastor and an unlikely ally helps her realize God’s promises of unconditional love and grace applies to her and her unborn child. In “Emma’s Dancing Socks,” a mother is forced to admit that clinging to God’s promises requires her to trust Him, even when she’s not ready to let go of her greatest fear. Please join me and my fellow Inspire Christian Writers as we celebrate the release of our 2014 anthology. The Inspire Promise book signing event will be held on Saturday, December 13, 2014 from 11am-1pm at Oasis Christian Mission Center, 10255 Old Placerville Road, Suite #1, Sacramento, CA 95827. Inspire Promise will make a great Christmas gift to encourage anyone who is trusting God to keep His promises in and through their own circumstances. 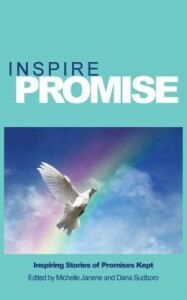 To read my stories, along with the other great stories written by my fellow Inspire Writers, you can buy your copy of Inspire Promise online at Barnes and Nobel or Amazon. Inspire Victory will be sold at the book signing event on Saturday, December 13th, and is also available online at Barnes and Noble or Amazon. Thanks for your continued support and encouragement as I share God’s truth through the writing and speaking ministry He’s placed on my heart. Your prayers and fellowship as readers is priceless. 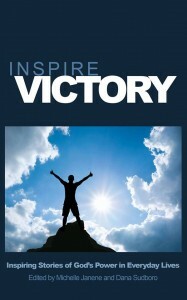 Inspire Christian Writers is celebrating the launch of Inspire Victory during the month of May, 2014. I’m praising God for the privilege of serving through this awesome ministry opportunity. My short stories, Never Alone and The Apology, and one poem, Amazing By Grace, have been published in this year’s anthology. I pray God will use every writer in this anthology to inspire readers to rise up with victorious praise in all circumstances. Please help us spread the word so we can continue spreading God’s Word through the art of storytelling and poetry. 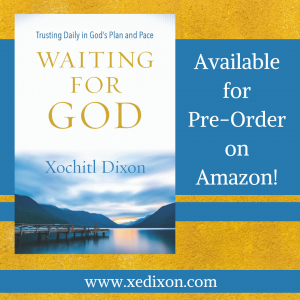 You can order your copy at Barnes & Noble or Amazon today! It’s been twenty months since I started my healing journey, which has included multiple surgical procedures and injections to control daily high levels of pain. I’m currently recovering from my second shoulder surgery and preparing to receive a nerve ablation in my upper thoracic back. Though this season of physical affliction has been difficult, God has been using this learning opportunity to deepen my faith! I look forward to returning to a more consistent blogging schedule and sharing what the Lord is teaching me as we continue to encourage one another and nurture our spiritual growth. Thank you for subscribing to my blog. I pray for you and enjoy reading your comments. 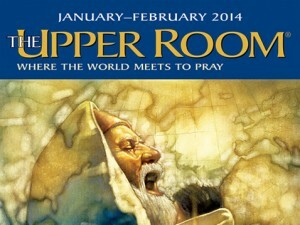 My Devotion has been Published in The Upper Room Magazine! Over two years after submitting my devotion to be considered for publication, “The Master Craftsman” is being read internationally in The Upper Room magazine and online on February 18, 2014. To God be the glory for this humbling privilege, as I’m blessed with the opportunity to serve through the ministry of The Upper Room. This devotion was inspired by my dad’s passion for carving beautiful artwork into his custom made quivers, as well as my desire to see others, and myself, as God’s amazing masterpieces. Please pray the Lord will overwhelm readers with His love as they read this simple reminder of our incredible design, priceless value, and unique purpose as God’s awesome creations. I have already been blessed by the comments from the community of Upper Room readers who encourage one another and are ministering to my heart through their amazing faith and love for God’s people. To read and share “The Master Craftsman,” please visit The Upper Room blog, where you can also see photos of my dad creating his leather masterpieces. I’m grateful for your continual support in reading and sharing my work. But most importantly, I’m thankful for the opportunity to grow with you as we walk by faith, one Spirit-empowered step at a time. Thank You, Lord, for reminding us that You are Immanuel, God with us. When we are facing uncertainty, You shine a light on our path. When we are feeling isolated, lost, or alone, You hold us firmly in love everlasting. You go before us and secure our flank. Your presence overpowers the magnitude of our circumstances. Your Word reminds us we can do nothing apart from You. Even though we know You’re constantly present with us, we invite You into our day to day living, Lord. We invite You into our writing process, too. Please give us the story ideas that bring You glory. Help us seek Your face before we sit down to write. Help us bend to You as we craft each piece, allowing you to guide our word choices. Help us praise You as we welcome You into the editing process. Help us trust Your plan, even when it differs from our expectations. May each piece we write be a reflection of our communion with You. We surrender our writing journey to You, Lord. How do you invite God into your writing process? Scripture affirms that Christians grow in community. As we work through conflicts and serve one another within healthy and holy relationships, God prunes His children so they bloom in Christ-like attitude and behavior. This biblical perspective of growing in spiritual maturity applies to the writer’s journey, as well. As Christians wanting to use our gifts for His glory, we need community in order to grow spiritually and hone our craft in excellence. When we remain humble and teachable, we honor God and can improve our writing skills in ways we could never manage in isolation. A good critique group and continual training, especially through writers conferences and workshops, help prepare writers to rise up out of the slush piles. 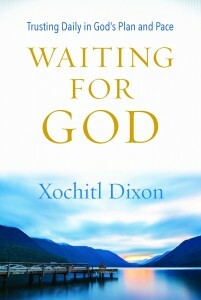 Since I’ve joined Inspire Christian Writers, my writing skills have been sharpened and my work has been published. My critique group helps me catch mistakes that my eyes skim over after I’ve completed numerous self-edits. They help me identify my pet words and phrases, challenge me to use active verbs and develop a deeper point of view for my characters. They encourage me to strengthen my plot and keep my dialogue meaningful. 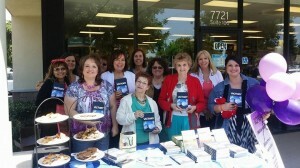 As a member of Inspire Christian Writers, I’ve been blessed with another perk. These writers pray for me! The emotional support and thriving sense of community are priceless. Their prayerful and professional feedback helps me take my writing to a higher level of quality. They prove time and again that there is always something new to learn and that everyone has something of value to offer to my growing process. 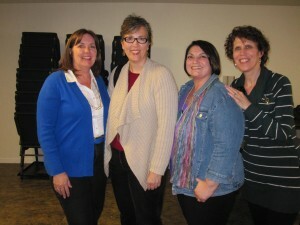 When we’re connected to a positive and diligent group of writers, we can build one another up in love, support and encourage one another as God grows us spiritually through our writing journey, and challenge each other to excel in the craft. It’s also a whole lot more fun when we know we’re not alone on this crazy adventure of learning to use writing as a tool for ministry. How has your experience in critique groups helped you improve as a writer? 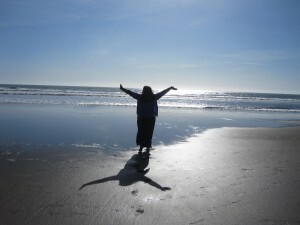 If you’re not a writer, how has God used community to grow you spiritually? We can all benefit by hearing your story. 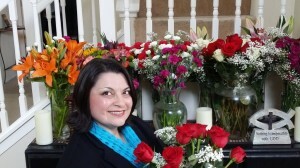 Shannon Dittemore is the author of an amazing YA Fantasy saga. In the Angel Eyes Trilogy, Dittemore weaves supernatural truth into her vibrant storytelling. Her vivid imagery, intriguing character development, and powerful message of hope are only matched by her genuine voice and exhilarating plot twists. Angel Eyes, Dittemore’s debut novel, was published by Thomas Nelson in the summer of 2012. Brielle is given the gift of sight into the Celestial. Her dreamy boyfriend, Jake, reveals his secret power. And the couple fights for their lives as an evil human trafficking ring is uncovered. I zipped through that book in a few days and waited anxiously for the February 2013 release of Broken Wings. In Broken Wings, Brielle and Jake question The Throne Room, their own motives, and the uncertainty of their relationship. Their adventure ends with a shocking twist that had me begging for a sneak peek at book three. 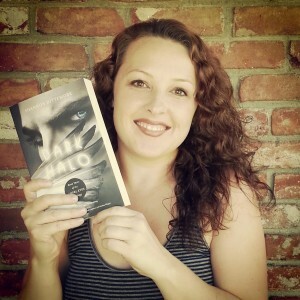 I was blessed to receive an early copy of Dark Halo, the brilliant conclusion of the Angel Eyes Trilogy. By the time I read the final page, I was inspired by Brielle’s courage to fight temptation and trust God’s timing, even though she would have to risk losing everything. Dittemore will be celebrating the release of Dark Halo at Barnes & Noble in Citrus Heights, California, from 1-3pm (PDT) on Saturday, August 24, 2013. 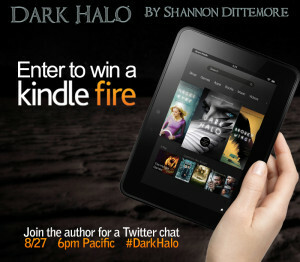 I’ll be hosting a live interview with Shannon Dittemore on Twitter, Tuesday, August 27th from 6-7pm (PDT). Please join us for an hour of with this intriguing author, with prizes announced every 15 minutes, and help us spread the word about this stunning saga!